Bob Riley (born October 3, 1944) is a Republican former governor of the U.S. state of Alabama, a position that he held from 2003 to 2011. In his first term, Riley worked to improve education, put Alabama’s economy on the right track and restore honesty to the executive office. He won reelection in 2006 by a 58-42 percent margin over the Democrat, Lucy Baxley, then the sitting lieutenant governor. Riley is only the third Alabama governor to win re-election in modern times, the others having been George Wallace and Guy Hunt. 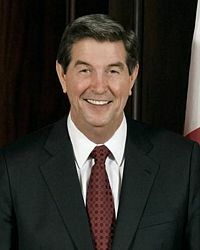 Prior to his election as governor, Riley was from 1997 to 2003 a member of the United States House of Representatives from Alabama's Third District. Riley was born and reared in Ashland, Alabama, where his family has lived on ranches and farms for six generations. For more than thirty years, Riley ran a number of successful businesses, including a grocery store, trucking company, a car dealership, a real estate company, and a small pharmacy. He has been a cattleman for more than twenty-five years. Riley is married to the former Patsy Adams, also from Ashland. The couple has reared four children and has six grandchildren.